The Economic and Financial Crimes Commission ( EFCC) yesterday gave Governor Ayodele Fayose a September 20 appointment over the allegation of his involvement in a N4.685billion fraud in the Office of National Security Adviser(ONSA). The EFCC’s letter was a response to Fayose’s letter of September 10, 2018 where he indicated his interest in appearing before the anti-graft agency on October 16 after he had completed his tenure. About N4.685billon was transferred by the Office of National Security Adviser (ONSA) to Sylva McNamara Limited, a company linked with a former Minister of State for Defence, Mr. Musiliu Obanikoro. Out of the sum, about N3.880billion was allocated to both Governor Ayodele Fayose and Senator Omisore through cash and bank transfers by Obanikoro. Omisore’s share was said to be about N1.7billion. The EFCC’s September 13 letter to Fayose was written by the Director of Operations, Umar Mohammed. The letter said in part: “I write to refer to your letter dated 10th September, 2018 relative above captioned subject. “I appreciate your sense of duty and responsibility as a law-abiding citizen who wishes to submit yourself voluntarily to the due processes of the law more so as your immunity as a governor shall soon come to an end. “In view of the above and your request to make yourself available on Tuesday, the 16th of October 2018 to make clarifications on ongoing investigations that affect you, we look forward to receiving you even earlier than the 16th of October, 2018. “In this regard , we shall be willing to receive you on Thursday , 20th September 2018 without prejudice to your immunity under Section 308 of the Constitution of the Federal Republic of Nigeria, 1999. 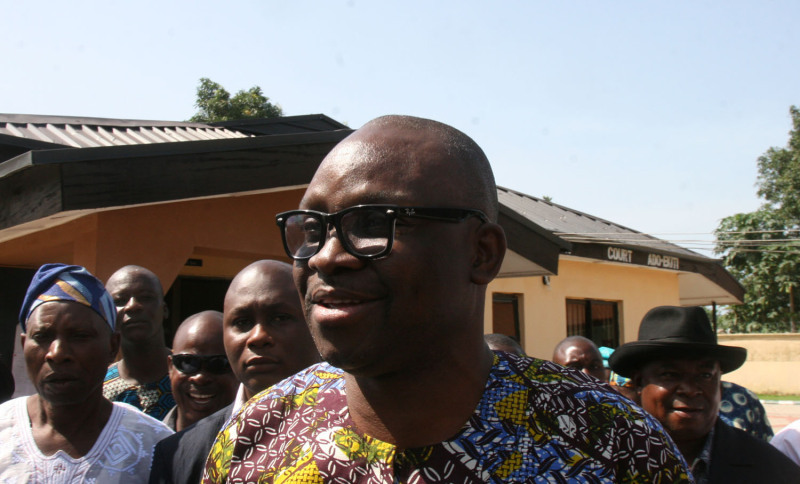 In his September 10, 2018 letter, Fayose said: “Several and serial actions of your commission for some time now, including but not limited to freezing of my accounts and attempts to secure temporary forfeiture of my properties, are indicative of the commission’s desire to have me clarify some issues or answer some questions but for the immunity that I enjoy under Section 308 of the 1999 Constitution as sitting governor of Ekiti State. Next article51 killed in Adamawa by suspected Fulani herdsmen.